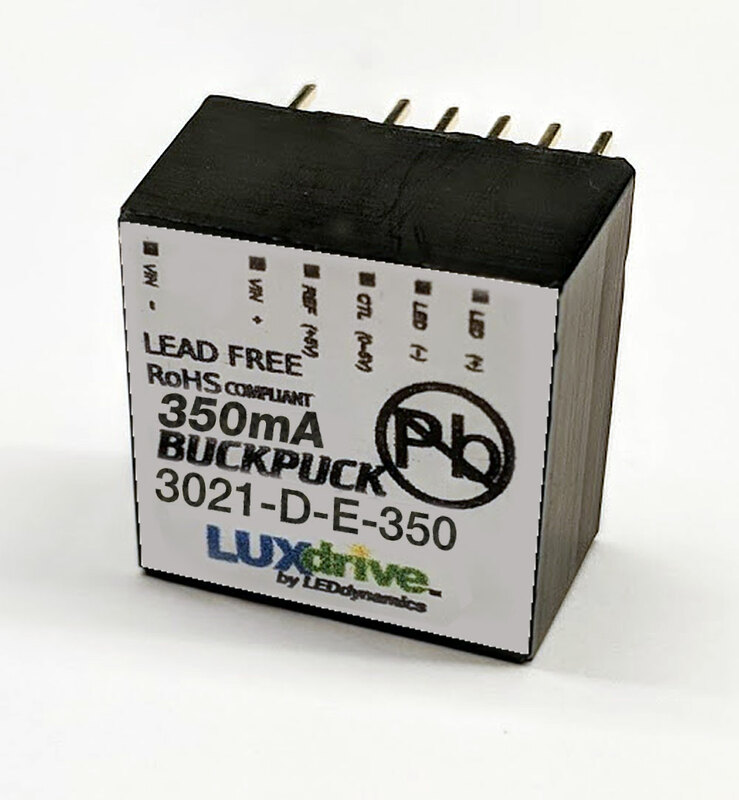 The 3021-D-E-350 BuckPuck is a 350mA, 7-32 DC, current regulating driver designed for powering all types of high power LED modules and arrays. A fast response, current-sensing circuit makes it ideal for LED flashing or strobing. This driver requires no external current limiting resistors or heat sinking. It features a 7-pin SIP connection for through-hole PCB mounting, or it can connected to with an optional wiring harness. Due to the nature of a buck regulator, the input voltage to the driver must always be higher than the total forward voltage drop of all series connected LEDs. For example, if you have a series connected string of six LEDs where each LED has an average forward drop of 3.5V, the required minimum input voltage would be 23.5VDC. (3.5 x 6 + 2.5) A standard 24VDC power supply would be a good choice for this application. The actual value will vary greatly depending on the input and/or output voltages. Value shown is for Vin = 24VDC VOUTt=20VDC LED load. Actual values will be smaller in most applications.